This story was updated at 11:05 a.m. EDT. 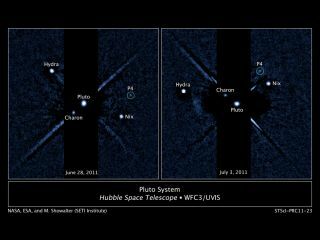 A tiny new moon has been discovered around Pluto, the fourth and smallest one yet found orbiting the dwarf planet, photos from the Hubble Space Telescope reveal. The moon, which has been temporarily named P4, was spotted in a Hubble survey searching for rings around Pluto. "I find it remarkable that Hubble's cameras enabled us to see such a tiny object so clearly from a distance of more than 3 billion miles (5 billion km)," Mark Showalter of the SETI Institute in Mountain View, Calif. said in a statement. Showalter led this observational survey with Hubble. Illustration of the Pluto Satellite System orbits with newly discovered moon P4 highlighted. Pluto's new moon is located between the orbits of Nix and Hydra, which Hubble also discovered in 2005. Charon was discovered in 1978 at the U.S. Naval Observatory and was first resolved using Hubble in 1990 as a separate body from Pluto. The finding is a result of ongoing work to support NASA's New Horizons mission, which is scheduled to fly through the Pluto system in 2015. The mission is designed to provide new insights about worlds at the edge of our solar system. Hubble's photos of Pluto's surface and the discovery of its satellites have been invaluable for planning for New Horizons' close encounter. The dwarf planet's entire moon system is believed to have formed by a collision between Pluto and another planet-sized body early in the history of the solar system. The galactic smashup flung material that combined into the family of satellites observed around Pluto. Our own moon is thought to have been created by a similar collision between Earth and a Mars-sized body 4.4 billion years ago. Lunar rocks that were returned to Earth from the Apollo missions led to this theory, and scientists think material blasted off Pluto's moons by micrometeoroid impacts may form rings around the dwarf planet. So far, Hubble's photographs have yet to show any such rings, but the detection of P4 shows that big discoveries can sometimes be unexpected. "This surprising observation is a powerful reminder of Hubble's ability as a general purpose astronomical observatory to make astounding, unintended discoveries," Jon Morse, director of the astrophysics division at NASA Headquarters in Washington, D.C., said in a statement. P4 was first seen in a photo taken with Hubble's Wide Field Camera 3 on June 28. It was confirmed in subsequent Hubble pictures taken on July 3 and July 18. The moon was not seen in earlier Hubble images because the exposure times were shorter. There is a chance that P4 appeared as a very faint smudge in images from 2006, but was overlooked because it appeared obscured, scientists said. Pluto was discovered in 1930, but its planethood was thrown into question when the International Astronomical Union came up with a new definition of "planet" in 2006. That year, Pluto was demoted to the status of "dwarf planet," a newly created category to describe many other objects in the Kiper Belt, the ring of icy bodies beyond Neptune.